My story started when I came home one afternoon to the most pitiful young dog lying on our front porch. She was starved, dehydrated, approximately 75% bald with massive bloody oozing sores, scabs, and open wounds all over. She smelled like roadkill, and it was apparent that she had been this way for a long time. My heart went out to her, and I couldn’t imagine her pain, suffering, and the history of her life so far… So began the journey with my dog named Lily Bell. Today Lily is nothing like the heartbreaking creature that turned up on my doorstep. Her recovery is nothing short of miraculous and Mite Avenge has been a wonderful big part of her ongoing success story. Part of Lily’s original diagnosis at our first vet visit was a severe case of Demodectic mange, along with a long list of other problems. She also had an internal infection, cough, fever, three different kinds of worms, skin infection, malnourishment, etc. It was pretty overwhelming and her prognosis was poor as to whether or not she would even make it. She was to be put down, and I decided to keep her. It was guessed that she was about 7–8 months old and a mixed mutt with some pit bull in her. I was preparing myself for what I was told would be a very long and expensive future with no guarantees as to the outcome. Her immune system was very weak and she was very sick. I had no prior experience at all with any kind of mange, so the best I could do was listen to what the vets told me. I was advised that some areas on her skin were so bad that I should expect probable scarring and her hair might not ever fully come back. 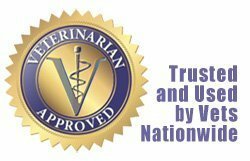 I consulted several different vets, and both the diagnoses and treatment options were basically the same. So we started on high quality grain free dog food, vitamins, antibiotics, and Ivermectin given internally for the mange. After a few months although her overall health was improving, the mange was not responding as well as we had hoped. The next step was to add weekly dips of Mitaban and hope for the best. Well, a few hours after her first dip, her reaction was so bad it scared me. Lily was unstable like a drunk, she had droopy red eyes, and she was lethargic. When I called the vet, I was told she was having an allergic reaction and would not be able to take any more dips. Truthfully, she had been poisoned, and as weak as her body was, she simply couldn’t handle it! So all the vet could tell me was to wash her often with benzoyl peroxide medicated shampoo and keep her on Ivermectin indefinitely and hope for the best. She was also still on antibiotics for a secondary staph infection that they couldn’t clear up, but that is another story. By this point I was fed up, angry, frustrated, feeling helpless, and deeply sad for Lily because she was going through so much. So here we were, lots of money spent, vet trips etc. and she was still suffering with ongoing, unmanaged mange. 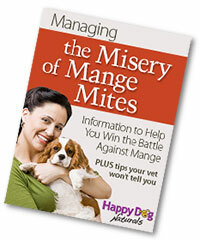 By now I had stared searching for a natural cure while learning all I could about the mange mites. Since I have a background of study of natural remedies, herbs, essential oils, vitamins, supplements etc., I knew there had to be something out there besides poisonous drugs and industrial pesticides. 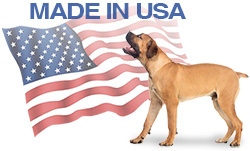 Most of the suggestions and ideas floating around the Internet were crazy, dangerous and extremely harmful to dogs. So my search continued until I came across this company, Happy Dog Naturals, and their product Mite Avenge. ow for me, I was very curious to know what was in their product and as soon as I read the ingredients I was immediately comforted because I knew I was on the right track. Then what a pleasant surprise to see it showed a 100% guarantee, so I checked out the testimonials and got really encouraged. I decided to call the company and get more information. I found the representative to be very professional, informative and truly caring. She explained to me all the things I could do to better Lily’s chances of recovery. I made up my mind to follow thru with all their advice, and to make every effort to do it right. So I ordered a bunch of the Mite Avenge, plus immune strengthener pills. My only regret is that I didn’t do it sooner! I knew by the second application that we were making progress. Her skin didn’t seem to hurt her as much when touched, and it looked better. What then surprised me was with weekly baths, Mite Avenge dip, how good and how far her progress went. You can see for yourself with the pics I have sent. It brought me much joy to be able to touch her and she not wince and jump because her skin hurts. Also to see a lush, beautiful coat that I was told probably would never happen. 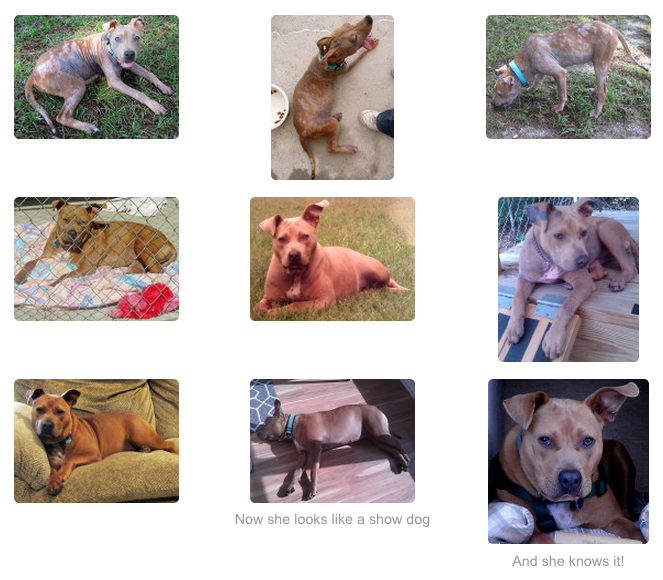 It’s been such a joy to see Lily turn out to be a beautiful pit terrier. I have taken her for visits to a couple of the vets who saw her early on, as well as to visit friends to show her off. The reaction is always the same. They all are very surprised to see her doing so well, and so fast with Happy Dog Naturals products and advise. I don’t normally go to such lengths but Mite Avenge touched my life in a profound way by healing Lily. She has become such an important part of my life. I want to share my story because I know there are many people out there like me who love their dogs and are looking for better alternatives with real results. I can only urge you to try Mite Avenge and their other products as well. It will be a blessing to you and your dogs. Thank you to Happy Dog Naturals!!! Lily and I are so grateful.